The aim of this chapter was to describe the regulatory classification and the list of ‘technological purposes’ of food additives by the European viewpoint. At present, food additives are extremely useful. Significant progress has been made in the field of health and nutrition. Food additives play an important role in the complex chain of modern food productions. In general, foods are subject to many environmental variables which may alter the original composition. Moreover, the presence of additives in foods must be declared on the label as an ingredient. Also, all additives used in the food industry are included in a ‘positive list’ by health organisations. 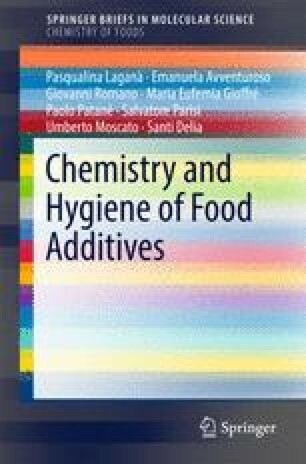 Finally, food additives are classified into functional categories, in relation to the declared action: food protection, colour or flavour enhancement, sugar substitution or structural and technological functions. This chapter provides also a description of these sub-categories with correlated examples.